Minor is the lowest rank in the Kig-Yar rank structure. They are commonly seen wearing turquoise Point Defense Gauntlets on their right arm and wielding Plasma Pistols in their left hand, as opposed to their superior officers, who wear orange or purple shields. Like Unggoy, the Kig-Yar are commonly seen in combat. Because of this, they are seen in almost every engagement with other types of Covenant forces. Kig-Yar Minors spend most of their time bombarding enemy forces with rapid-fire volleys of plasma bolts from behind their arm shields. 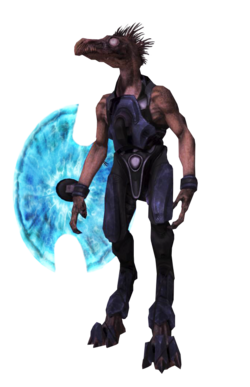 After the Human-Covenant War, the rank of Minor continued to be used in Merg Vol's Covenant and many of these Kig-Yar fought on behalf of the group during the Battle of Draetheus V in 2554. Jul 'Mdama's Covenant utilized the rank at Battle of Installation 03 and Battle of New Phoenix. Kig-Yar Minors are known for wielding plasma pistols as their standard weapon of choice. When engaging an enemy, they tend to overcharge their plasma pistols to eliminate enemy Spartans' energy shields and release volleys of plasma bolts to quickly eliminate them. When engaged by an enemy, Minors will use their personal arm shields to block enemy fire. When engaging a Kig-Yar Minor from afar, it is best to use a precision weapon such as an M6 pistol, Battle Rifle, or Covenant Carbine and aim at their exposed left hand. From medium range, weapons such as the plasma rifle, the SMG and the Assault Rifle provide good suppressive fire against a Minor, as a hit on their body will cause the Kig-Yar to stumble, momentarily exposing it to a melee or headshot. Alternatively, one can eliminate the Kig-Yar's personal arm shield by firing a volley from a plasma rifle or an overcharged shot from the plasma pistol. Once the personal arm shield collapses, the Kig-Yar Minor is open to all attacks. On higher difficulties, players should use either the long-range firing technique using a precision weapon or the overcharged plasma bolt. A Kig-Yar Minor firing a plasma pistol in Halo: Combat Evolved. An early render of a Kig-Yar Minor in Halo 2. Master Chief fighting a couple of Kig-Yar Minors in an early build of Halo 2. In-game view of a Kig-Yar Minor in Halo 2. A Kig-Yar Minor charges a plasma pistol in Halo 2. Cutout of a Kig-Yar Minor in Halo 3. A Kig-Yar Minor and Major shielding themselves. The personal arm shields that Minors carry are impervious to most ballistic munitions. A group of Kig-Yar Minors being led by a Kig-Yar Major in Halo: Reach. A Kig-Yar Minor on Installation 04 in Halo: Combat Evolved Anniversary . A Kig-Yar Minor in Halo 2: Anniversary. A Kig-Yar Minor teasing an Unggoy Minor on Installation 05 in Halo 2: Anniversary.